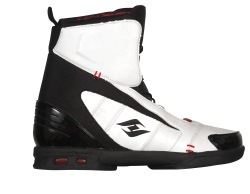 JD Webb’s first pro model boot was designed to perfectly complement his freeride style. The Webb Boot interfaces with the System Binding allowing for a lightweight feel and maximum comfort. JD’s new boot is built like nothing the wake industry has ever seen because of its true footwear construction. Beginning with a lightweight EVA outsole and TPR impact pods the JD Boot creates great cushioning under foot. Custom insoles with integrated arch support cradle the foot from maximum stability. Our exclusive Ultralon heat moldable liner material creates a custom fit and comfort throughout the boot. The Webb Boot also features a lower cut cuff and softer flexion to provide the broadest range of motion in the System line up.